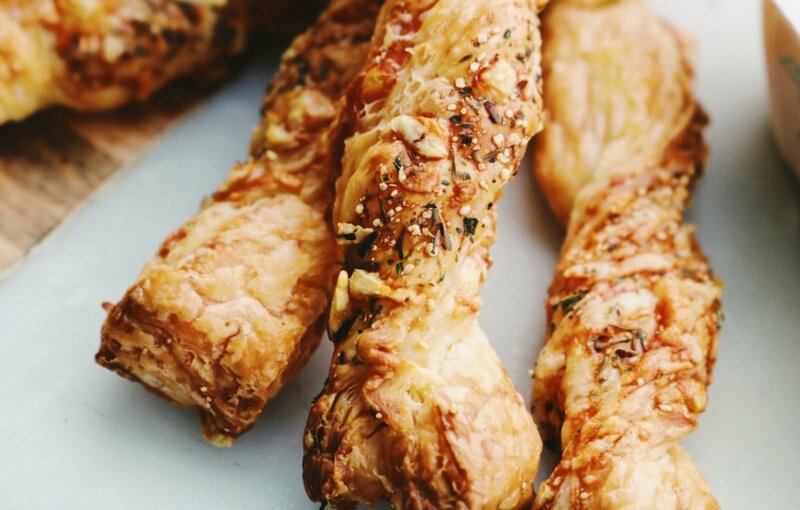 Fresh cheese pastry twists aren't something that you are going to want to add to your daily diet, but when the cravings are real, why not try baking your own with added protein cheese for that higher protein hit. Here we show you just how easy it is to make these high protein cheese twists, and you can get as creative as you want with the toppings - paprika, chilli flakes, sesame seeds..the list goes on! Eatlean Protein Cheese - With all the pastry, we don't need to add any more fat or calories to this recipe so opt for a low fat, high protein cheese to cut back on the calorific content. Eatlean Shaker - Higher in protein and lower in fat than parmesan, our Shaker Protein Cheese still packs the all natural concentrated flavour without the added fat content. You’ll need a chopping board or clean counter to roll out your puff pastry on, take half of your Grated Protein Cheese and half of your Shaker Protein Cheese and spread evenly on the work surface, roughly to the size of your pastry sheet. Gently roll out your pastry on top of the cheese, then gently run a rolling pin over it a couple of times – avoid pressing hard you simply want to encourage the cheese to stick to the pastry. Take the rest of your Grated Protein Cheese and your Shaker Protein Cheese and sprinkle over the up-side of the pastry sheet, covering evenly. Again roll over the pastry once again applying only a little pressure, to encourage the cheese to stick. Take a sharp knife and cut the pastry into 2cm – 3cm wide strips, then one by one twist the strips placing them onto the baking tray. Pop them into the oven for 10-15 minutes until the pastry rises and turns golden, then allow them to cool before enjoying!